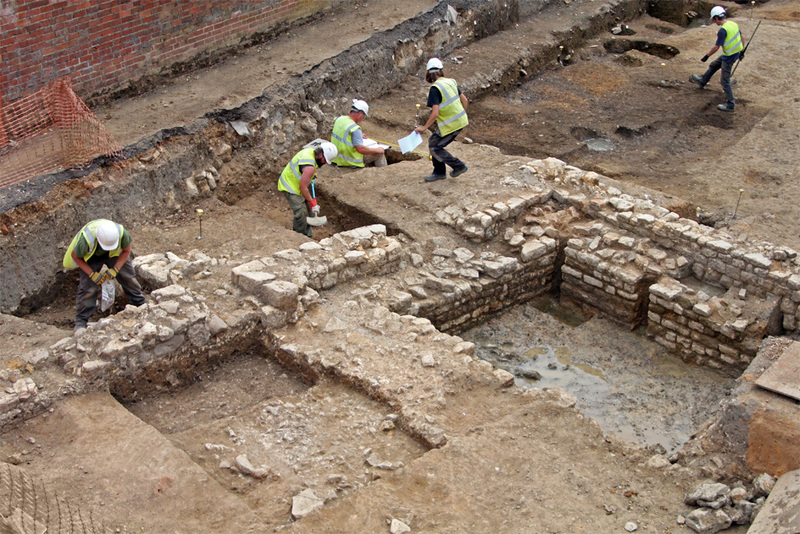 In one of the most extensive excavations in the Northamptonshire town of Towcester (Roman Lactodurum) a substantial Roman stone-founded building came to light. It lay in a back-plot of the Roman town, between Watling Street and the disturbed remains of the 2nd-century defences, about 40 m away from the projected street frontage. 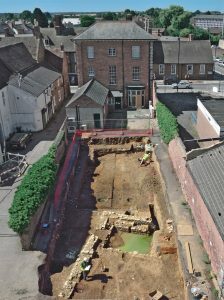 Since the building and an adjacent metalled road were aligned at an angle to Watling Street, it is possible that they respected another Roman road running acutely from Watling Street, cutting the corner off the present Northampton Road, and exiting the town to the north-east, towards the Roman settlement at Duston. The stone-founded building was built in the later 2nd century AD, replacing an earlier phase of building on this plot of which little remained. It incorporated a cellar formed of a double thickness of limestone walling set in clean blue clay that had been deposited both between the walls and outside the outer wall. The floor also consisted of a layer of blue clay 0.3 m thick. The cellar had clearly been made waterproof with a lining probably intended to keep it dry, although it equally enabled it to hold water, as demonstrated during the excavations. Demolition debris from the cellar included an unusual number of cattle skulls and at least six complete vessels – mostly jars but also a dish that had been used for cooking – dating to the 3rd or 4th centuries. It is at present a matter for debate whether the vessels had been stored in the cellar, or whether they represent some form of closure deposit at the building’s demise.